Do you have one of those rooms in your house that you think is almost finished and then it just as quickly becomes “unfinished?” My dining room is that space in our house. Since moving in, I’ve slowly but surely taken every accessory and piece of furniture from there to use in other rooms until we literally just have the table left standing. So, I’ve been scouring through images of dining rooms and I keep finding that white chairs are catching my eye, particularly ones with cane backs. My kids climbed all over them (the true test), and they seemed to be in good shape. And, the caning is all in tact, so it ended up being a deal I couldn’t pass up. It’s actually an outdoor fabric (which I thought would be great for a dining room) and was only $7.98/yard. I was a happy camper! I haven’t quite worked out the rest of the dining room details, so be prepared for more random thoughts to come. . . .
What a great price! I am so impressed and I love love love that fabric! Wow! The chairs and fabric are steals. I can’t wait to see the finished product! Those are going to look great painted! I love that fabric, can’t wait to see the finished product! That is such a great deal!! The blue on white will be beautiful. Can’t wait to see it. How’s the office coming along? i know the exact feeling you are talking about. in fact, i feel that way about every room in my place. great find on those chairs + fabric. Oh my!!! that was a great deal. And I love the chairs and fabric. I was just looking at that fabric at JoAnn fabrics the other day, but in citron. Can’t wait to see what you do to them! What a great find and I love the colour and pattern of the fabric. Can’t wait to see it when its all done! Awesome deals!! Can’t wait to see the after! That is an AWESOME deal! Can’t wait to see the finished product – that fabric is going to be perfect. Those chairs are great finds! Looking forward to seeing how they turn out in that awesome fabric! OOOOH! I can’t believe you found 6 of those for only 75 bucks! And I LOVE the fabric you picked! Can’t wait to see the finished product! LOVE that fabric…and the price! I can’t wait to see how you use it! Great find! I love that fabric and it’ll be perfect on those chairs once they go white. And I’ve got outdoor fabric on my banquette and it’s brilliant — spills just wipe up! What a steal!! Can’t wait to see them all done! Wow, what a steal! Those chairs are fantastic. I love the color of the fabric, and good call on outdoor fabric – easier to clean with the kiddos. Please share pictures of the finished product when you are all done! i love that second image. your fabric will look great with those chairs! 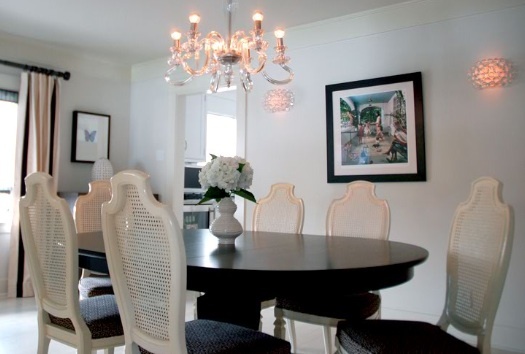 Love the caned back chairs especially when they’re painted white! I’m excited for your chairs makeover – can’t wait to see the ‘after’. I have the same fabric but in the green colorway – love it! Yes, this has happened to me! You are off to such a great start with the chairs and fabric! Love using outdoor fabrics on heavy use pieces. I used 2 different ones on our laundry/mudroom bench!